Some Returns and a Gift! 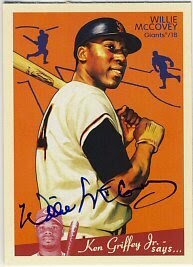 I received my 2008 Goudey signed by Willie McCovey today. I had sent this one in to an AtommicSports signing on March 20th. I'm contemplating sending in one for Eddie Murray, but it's pretty spendy. 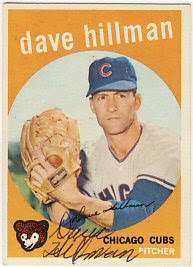 I think I'll send in '54 Topps to Berra and Ford first. Today I received three returns as well as a gift from a reader of my blog! 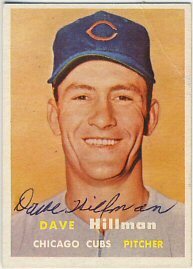 Dave Hillman signed a 1957 and 1959 Topps for me. 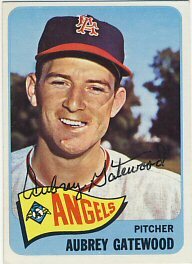 Aubrey Gatewood signed his 1965 Topps. 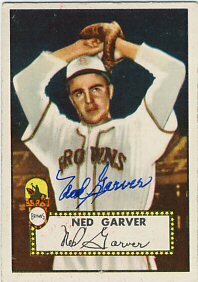 Ned Garver signed his 1952 Topps and included a signed Diamond Signatures card. He also included a postcard about his book for sale, which I think I'll buy. 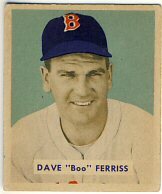 Finally, Art, a reader of my blog and fellow member of SCN, read my blog post in January regarding Dave "Boo" Ferriss. While at a card show, he came across a 1949 Bowman of Ferriss, which I have been looking all over for (look on eBay, there are none there!). He picked it up for me and sent it to me as a gift! How nice is that? To return the favor, I'm sending him a card as well. He's a Red Sox fan, so I've picked out something that I think he'll like. Thanks Art! Monday I received a couple of my recent requests back. 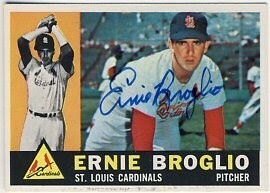 Ernie Broglio signed his 1959 and 1960 Topps. 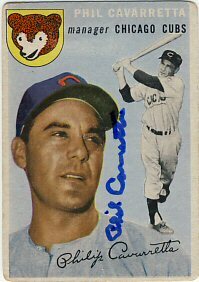 And Phil Cavarretta signed his 1954 Topps. The Twins finally signed Mauer to a nice long contract. Apparently my boycott worked. I didn't want to have to play hardball, but it got the job done. I've started reading the new Willie Mays biography by James Hirsch. I'm about 210 pages in (out of about 550). So far it's pretty interesting. More factual than any insight into Willie's personality. Two more returns today. One for me and one for my son. 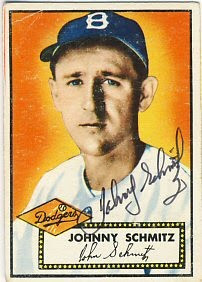 I got back a 1952 Topps I sent to Johnny Schmitz just five days ago. 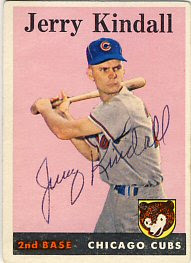 My son got back Jerry Kindall on a 1958 Topps in about 10 days. I'm looking forward to the start of the baseball season. I'm not sure what the Twins are going to do to replace Nathan. I've also decided to not buy any tickets to a game until they sign Joe Mauer. I'm sure my little personal boycott will bring the organization to its knees. Maybe you'll notice those four empty seats in the stands. Those are the ones I would have bought had they signed Joe. There's still a couple of weeks left, so maybe they'll sign him. I sure hope so. At the last card show we went to, my son bought a few 1958 Topps to send out. I helped him identify those players that sign well through the mail. 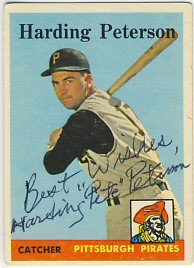 He sent out a handful of them already and today he got back Harding "Pete" Peterson. 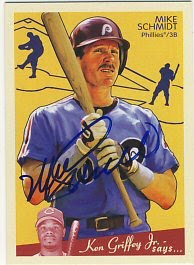 I also got back a 2008 Goudey signed by Mike Schmidt from an AtommicSports signing. I finally broke down and paid for it and was able to get it done for less than $50. 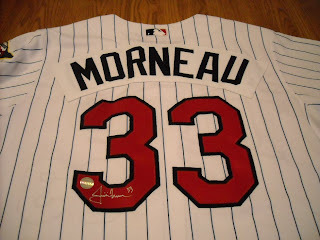 Today I received items back from a Lojo Sports Justin Morneau signing. They don't provide a mail order service, but an SCN contact somehow arranged to do some mail order for them. They weren't taking bats, but I sent in a ball, a jersey, and two mini helmets (one for one of my sons). This sure beats standing in line for 4 hours and not getting him at TwinsFest. They take a lot of room to display, but I'm really starting to enjoy these jerseys. I hope to add Carew next month, and Killebrew and Oliva next year at TwinsFest. I'm not sure if I'll get any more current players, but I'm thinking about Denard Span. I finally have something to post about. I sent a John Wheeldon print to a Jim Perry signing. 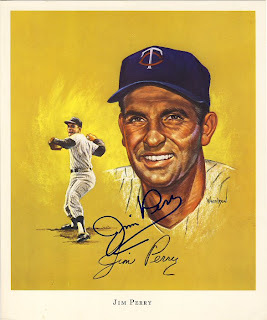 I was hoping to get this signed at TwinsFest, but Mr. Perry didn't attend as scheduled. I never heard why. 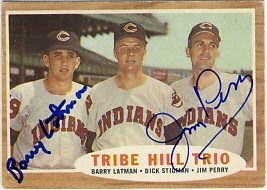 My son sent in his 1962 Topps Tribe Hill Trio already signed by Barry Latman. Mr. Perry signs through the mail, but for the low cost of this signing, it seemed safer to send these items in rather than directly to Mr. Perry. I managed to send out about 5 ttm requests on Monday and my son sent out a few last week. 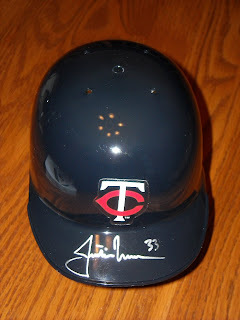 I am expecting a few items back from paid signings including Justin Morneau, Mike Schmidt, Carlos Gomez and Jim Perry. 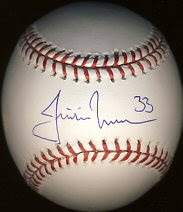 I also sent a 2008 Goudey to a Fred Lynn signing today. Hopefully I'll start having items to show off soon. 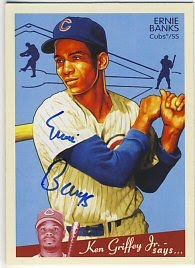 Today I received a 2008 Goudey signed by Ernie Banks from a signing at Jim and Steve's. It was delayed a few weeks but came back signed nicely. I also got a ball signed for a friend and it looks great. I have a 2008 Goudey out to a Mike Schmidt signing and am planning a few more including Eddie Murray, Fred Lynn and Willie McCovey. This set is getting expensive. 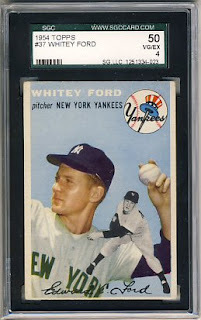 I also received another 1954 Topps Whitey Ford today that I bought on eBay. It's an SGC graded card. It's the perfect condition for an autograph: no creases, decent centering, reasonable corners, but still graded as VG/EX, so it was affordable at $40. Do a search on eBay and see if you can find another in this condition. It's not easy. The last one I sent to Mr. Ford came back signed twice. I've decided to send another. 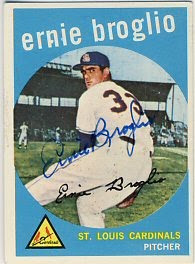 I'll also send Yogi Berra his 1954 Topps next week. I bought a couple new jersey display shadow boxes from Michael's. 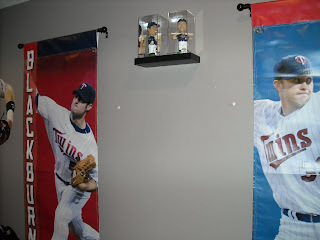 The ones I bought are smaller than the old one I had bought at Hobby Lobby for my Mauer jersey. 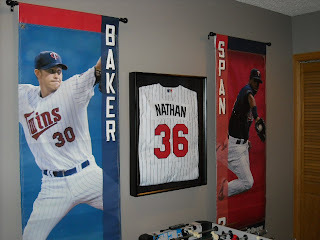 My wife was kind enough to help me pin my Joe Nathan jersey into one of the new ones. We also took down the Joe Mauer jersey and put it into one of the new frames. Since the old frame was wider, I had to fill the holes left behind and hopefully can find some left over paint from the basement walls to toucch it up before hanging it up in the new display. Today my sons and I went to the Twin Cities Sports Collectors Club (http://www.tcscc.org/) show at the Valley West Mall in Bloomington. There were a lot of dealers there today. 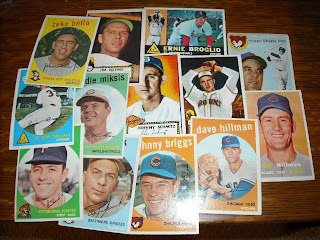 I picked up a handful of vintage cards that I'll send out. There's nobody in the lot I don't already have, but I"m starting to run out of guys I don't already have. I had to try to remember who were the good signers through the mail. 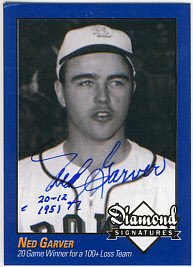 Included in the lot are a few 1952 Topps including Ned Garver, Johnny Schmitz, and Jim Delsing. After getting home, I discovered that Delsing passed away. I also picked up seven 1959 Topps for $1 each. We also stopped in Cedar Cliff Collectibles but none of us found anything there today. It's been a while since I had anything to write about, but today I finally got something back in the mail. 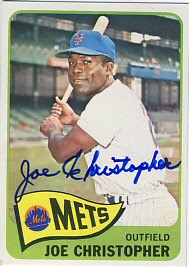 I sent a 1965 Topps in to a Joe Christopher signing that took place in late February. Mr. Christopher doesn't sign through the mail, so I paid $15 to get this signed for my set. I also sent in a 1965 Topps Albie Pearson to the same show promoter and hope to get that back in April sometime. I have identified a few 1965 Topps that I can send out through the mail to mediocre to poor signers ttm, and hopefully I'll find some time later this month to get those sent out.